Four armed enemies down, one to go. Having vanquished several foes with signature moves such as the Glide Kick, Batman is trying something new. He whips out a Remote Claw, which he attaches to a metal fuel container. Then, he attaches the second part to his last target. The two collide, and the Dark Knight has cleared the room. It's one of a handful of fresh options video game players will have when embarking as the Caped Crusader in Batman: Arkham Origins, out October 25 for the PlayStation 3, Xbox 360 and Nintendo Wii U. Arkham Origins is the first Batman title not developed by Rocksteady Games, the creators of Arkham Asylum and sequel Arkham City for Warner Bros. Interactive. 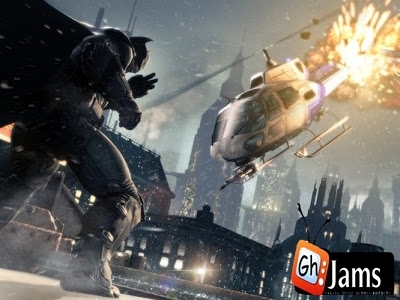 Helmed by WB's Montreal studio, the game takes place several years before the first two games, as a young Batman discovers himself A demo on display at the Electronic Entertainment Expo in Los Angeles focused on one of the new features coming to Arkham Origins: an enhanced Detective Mode. Batman approaches the scene of a police helicopter crash. Using clues from the environment, players will use the Batcomputer to replay how an event unfolded. In the case of the chopper, Batman notices the tail broke off, which takes him to the top of a building for a better view. The more players uncover on the scene, the more detail they receive on replays. As I press forward, it's clear the helicopter hits a sign after a mysterious bullet strikes the tail rotor. Overall, the enhanced Detective Mode works nicely, and seems to add more depth to crime scene investigations. The rest of the demo featured a variety of fights with criminals that were textbook Batman. Players perform the same type of combat choreography as they move from foe to foe with a flurry of punches and kicks. Same goes for the navigation, as players float through the sky using Batman's cape or grapple on objects with the Batclaw. What will be interesting to watch is how Arkham Origins stands out compared to its predecessors. The upgrades to Detective Mode and new storyline help, but I wonder what other tricks developers have in store when the game launches this October.